NIU have sold over 400,000 scooters globally with over 1 Billion kilometers travelled, placing them as the #1 electric scooter in the world. Powered by a 2400W Bosch Motor, the NIU outperforms 50cc petrol scooters with increased acceleration and of course, much less noise. Riding a NIU is joyful, fun and slick. Moving off the line is fast thanks do the rear wheel motor, providing responsive power delivery and quick acceleration. 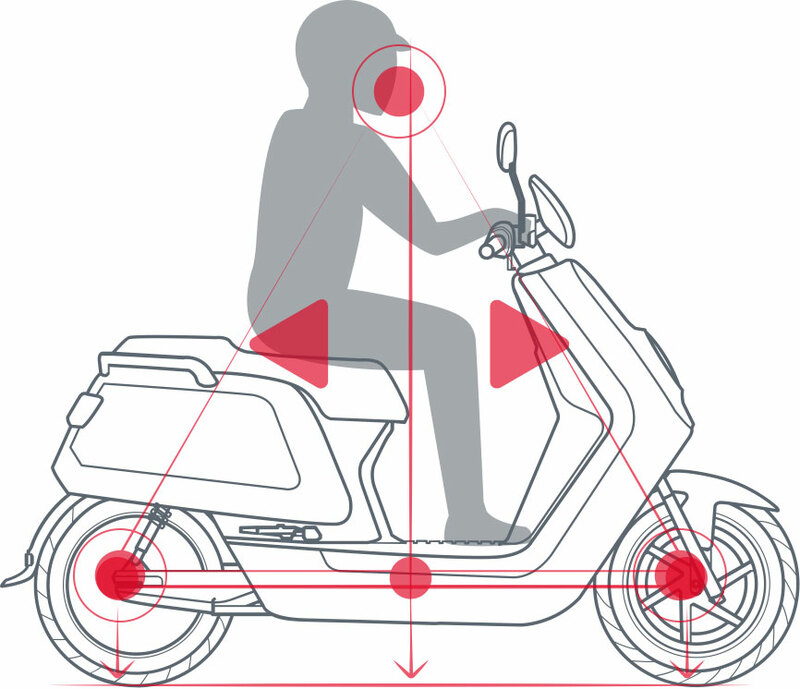 Getting on and off the scooter is quick thanks to a step-through design. The power delivery is actively managed by the on board computer, overcoming hills with more power when needed. Comfortable seats give a silky smooth ride. The genius of the NIU N Series electric scooter is in the simple design. To create something this seamless and easy to use takes a lot of design and thought which really shows. Well balanced and packed with clever features, the NIU has exceptional attention to detail. Passenger footrests are concealed when not in use, and a 19L storage compartment gives ample room for a helmet. There's in built USB charging port and bag carry next to the charging footwell. A lightweight 10KG battery with carry handle gives up to 50 miles of range on a single charge. Most riders have found they only need to charge every 4 days. Changing batteries takes just 10 seconds and is incredibly easy. Easy removal is designed for charging at home or at the office from a 3-pin plug. Each battery is made by LG and Panasonic and comes with a 2 year warranty. 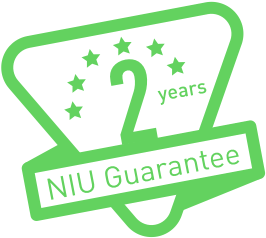 NIU's Smart App connects you to their cloud-based system. This allows for remote GPS tracking and alerts if unauthorised movement is detected, on-board diagnostic debugging and stats over riding history like power consumption and speed. Bright LED lights front and back. Battery rated to 600 recharge cycles, equivalent to nearly 24,000 miles. Hi, Is the 2400w rating the peak power? Isn’t this model fitted with the 1500w motor? And the price is already including the 20% government grant? Hi, yes the motor continous power is 1500w. The price does incude the 20% Plug in Grant. Many thanks. One of the most popular features of NIU bikes is the app. Easy to use it unlocks a new level of features and functions for your scooter. Remotely monitor the location of your bike. Real time diagnostics with remaining range and battery power. The removable battery weights just 10KG, and is extremely compact. Made up of 170 cells from Panasonic and LG, it's rated for 600 full charge cycles and has a 2 year guarantee. An integrated carry handle makes carrying a breeze, with removal taking just 10 seconds. Carry into the office for charging while you work, or take home and charge overnight. A rapid recharge ability means it can gain 15 miles range in just 15 minutes. NIU's scooters have been designed carefully to offer absolute balance with a minimal aesthetic. This results in a easy to ride, fun and powerful scooter that is quick away from lights and fun to ride around corners and narrow streets. With hidden functionalities that are there when you need them, the NIU scooter range has been designed for practicality above all else. Passenger footrests are hidden away when not in use. Hold handles are stylish worked into the bike frame. The seat has been carefully designed for comfort on bumpy roads and there's plenty of space for a passenger. USB Charger, bag hook and storage for a drinks bottle all make the NIU an extremely functional and well thought out scooter. The USB charger provided with easy range to the handles makes the NIU an ideal scooter for delivery drivers with a constant charge available for phones using navigation. The 3 ride modes can easily be switched at the push of a switch. Each mode has it's place around town. The scooter is started at the push of a button. A backlit LCD display gives key info at a glance without clutter and visibility day or night. Lights at both the front and the rear are high powered LED lights, offering great visibility to other road users. The iconic front lamp has a daytime running mode, as well as two modes of beam for evening nights. A rear TechnoLED lamp combines indicators, brake light, license light and standard rear light into one simple and stylish single panel. Brakes are rated to 230mm of water and all onboard components are rated to IP65, making the Scooter perfectly safe to use in rain, wind and dusty conditions.